Jay Leonhart grew up in a musical family. His parents and six siblings were all musically inclined. Everyone played the piano. By the age of seven, Jay and his older brother Bill were playing banjos and guitars and mandolins and basses. They played country music, jazz—anything with a beat. In their early teens, Jay and Bill were television stars in Baltimore and were touring the country performing on their banjos. When Jay was fourteen he started playing the bass in The Pier Five Dixieland Jazz Band in Baltimore. After studying at The Peabody Institute (1946–1950), Jay attended The Berklee College of Music (1959–1961) and The Advanced School of Contemporary Music in Toronto, before leaving school to start touring with the traveling big bands of the late 1950s and early 1960s. At twenty one, Leonhart moved to New York City to start his career. He played lots of funky road gigs with big bands, small bands and singers and visited many little jazz joints around the world. In 1968, he met and married a singer named Donna Zier and settled down in New York. Jay and Donna Leonhart have two children, Michael and Carolyn, who have performed with Steely Dan, among others. Upon moving to New York, Jay eventually began playing for many of the great jazz musicians, big bands, and singers who were to be found there – artists like Thad Jones and Mel Lewis, Lou Marini, Tony Bennett, Marian McPartland, and Jim Hall. Leonhart has continued to work with many of the great jazz musicians of the twentieth century. Jay also became a very busy studio musician in New York City, visiting every musical genre from James Taylor to Ozzy Osbourne and Queen Latifah. Between 1975 and 1995 he was named The Most Valuable Bassist in the recording industry three times by the National Academy of Recording Arts and Sciences. 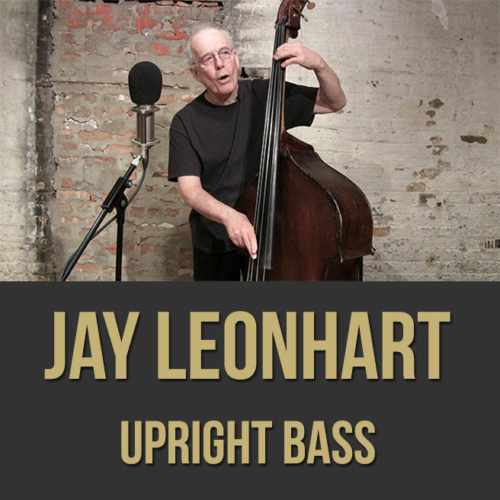 Jay Leonhart has now recorded fifteen solo albums and is also performing a one-man show called “The Bass Lesson” about his life in the music business and song. He has toured worldwide for more than forty years. Jay now performs regularly with trombonist Wycliffe Gordon in a duo which began as a result of their recording “This Rhythm on My Mind”.